Epic pagan folk metallers Bucovina from Iasi, Romania are back with their second album. Formed back in 2000, Bucovina released their debut full-length album “Ceasul Aducerii-Aminte” in 2006. After 4 years, they released the 24-minute EP “Duh“, published by the band and Tara de Sus. On April of 2013 the single “Day Follows Day, Night Follows Night” was out and on October of the same year the band finally self released its second full-length album, “Sub-Stele“. 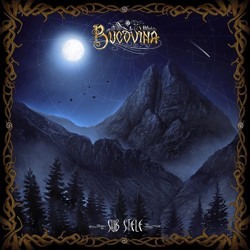 Bucovina have a quite different approach on folk metal compared to most bands of the genre. They don’t use any traditional acoustic instruments and they don’t cover existing folk melodies. They try to compose new pieces, based on their personal perception for Romanian folk culture in a wider specter and not only in terms of music. It is an effort to revive the timeless atmosphere of peasants’ daily life, seen through an epic pagan metal prism. It is for sure the most tight work of the band and at the same time the most aggressive. Guitars have again the basic role in their music and their compositions sound now more balanced and solid, without many differences between each song, unlike the previous EP. Epic rhythmic guitar riffs step on traditional scales, creating the perfect canvas for their wonderful characteristic clean male vocals, which have an equally epic and folkish touch. This time though, the band uses also pagan black metal screams much more frequently than their older works, something that makes the album much more interesting and powerful. The 7 tracks of ”Sub-Stele” last for 37 minutes, including as bonus the single “Day Follows Day, Night Follows Night“, which is practically the English version of the 4th track “Zi După Zi, Noapte de Noapte“, with a more symphonic folk approach. As promised, the band includes a remake of ”Luna Preste Vârfuri“, taken from the debut album. Bucovina will remake all songs of their first album and will include them one by one in their future works. The band has improved its production very much and their orchestrations sound richer than ever, even if, except for the typical metal instruments, they only add a few acoustic guitars and guest synths in a couple of songs. Except for the bonus track, all other lyrics are in their native language and you can find them in the CD booklet. “Sub-Stele” is a great and distinctive folk metal album, in my opinion the most mature and well-produced album of the band. Bucovina sound more solid and “mainstream” than ever and at the same time they retain their characteristic personal sound. My only complaint is the short duration of the album, since it practically includes 6 different songs and one of them is remake. The band has self-released “Sub-Stele” in cooperation with Tara de Sus in a standard jewel case edition CD. It comes with a 12-page booklet, illustrated by Kogaion Art, who once again created a fantastic cover! You can visit Bucovina’s official pages below to listen to their music and find more details if you are interested in purchasing the album.